The Man of Tomorrow was honored at "The World of Tomorrow" when DC Comics hosted Superman Day at the New York World's Fair, featuring the first public appearance of Superman in full costume and a live Superman radio broadcast from the fairgrounds. In this very first Superman costume, in order to introduce the character to the public, the name "SUPERMAN" was inscribed in the top part of Superman's chest emblem and Superman's boots were the original lace style. Ray Middleton was the man in the costume and is often credited as being the first actor to ever play Superman. He later starred in the Broadway hits South Pacific, Annie Get Your Gun, and others. Superman Day was the brainchild of publicist Allen 'Duke' Ducovny, held in part to promote the sales of DC's New York World's Fair Comics, a 100-page special edition sold exclusively at the World's Fair. In 1975, DC comic book historian Allan Asherman reported that this event occurred in 1939, at the 1939 World's Fair. At that time, he did not know the name of the "unknown actor" who portrayed Superman. It is not known how he discovered that Superman Day was in 1939. Since that time, many other sources (CD liner notes, books, etc) have cited this year, presumably using Allan Asherman as their source. 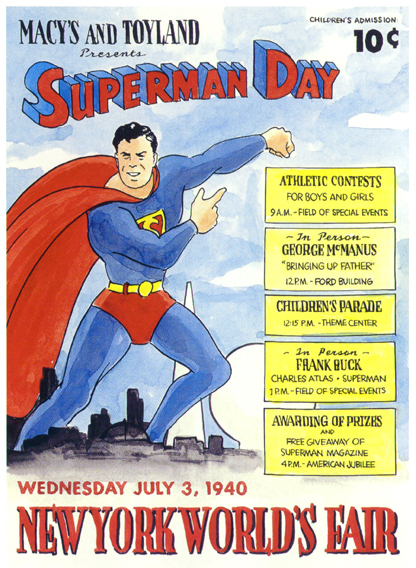 "Superman Day at the New York World's Fair was not 1939, but July 3, 1940. This was the first day that the admission price was reduced to a dime. "The artwork was done by Lou Zimmerman, who worked for, or at, Macy's. On the back of the artwork are notation's on why the art was rejected ... as if the obvious Macy's and Toyland was enough! "As the owner of this art - received from Dr. Elliot Faber several years ago - these comments have never been photocopied."